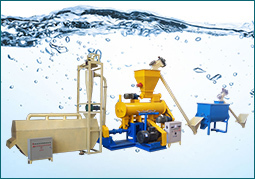 Wet type fish feed machine is widely used for producing grains into high-grade aquatic feed pellets for many kinds of pet like fish, catfish, shrimps, crab, cat, dog and etc. 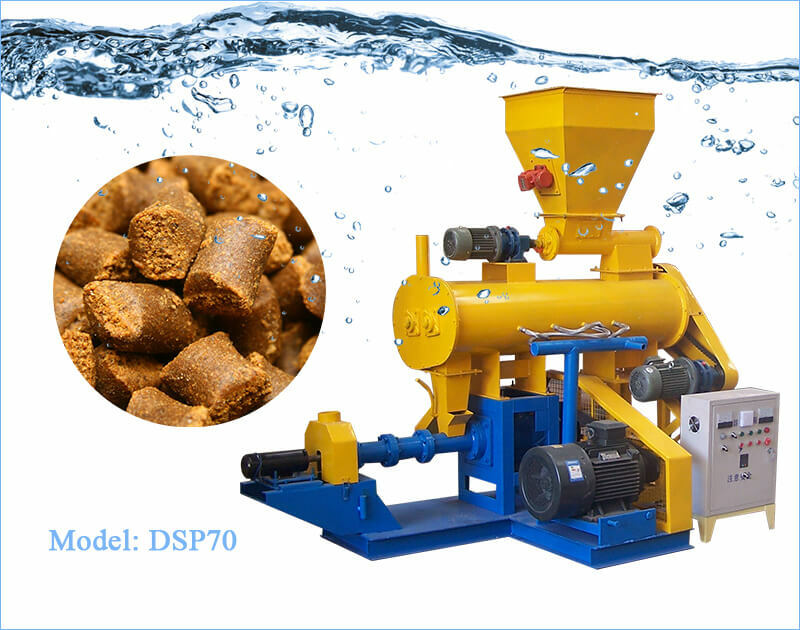 Grain materials employed in fish feed pelletizer are such as wheat, soybean, cake and other leftovers and etc., moreover puffing pellets produced by the pellet machine can float on the water surface without dissolution for over 12 hours. 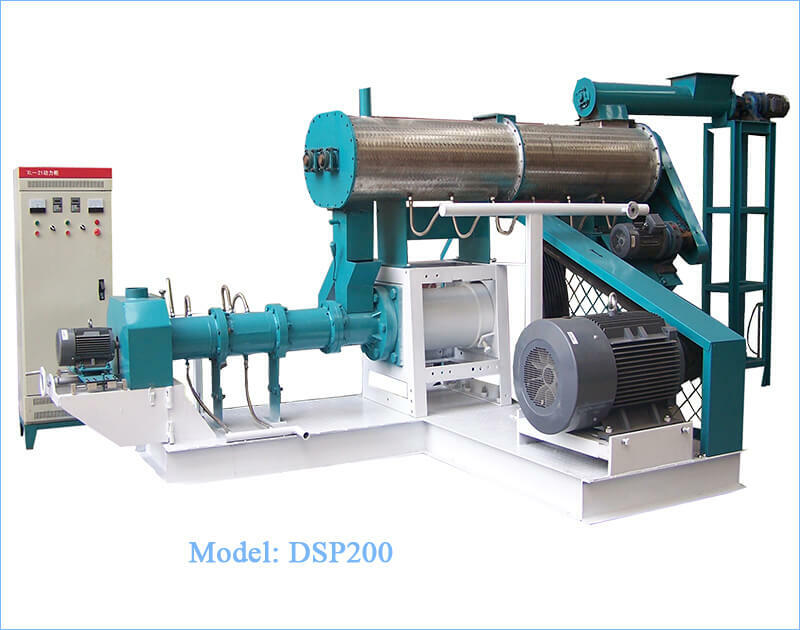 Wet type feed extruder is mainly employed in medium or large size feed processing factory and aquaculture farm. For large scale production of quality pellets, it is profitable to opt wet type feed pellet machine! 1.Boiler continuously offer hot steam into the conditioner, so materials can be fully cooked and the nutritional value is improved. Thus the quality and quantity of pellets can be improved greatly with lower power consumption. 2.High temperature and high pressure process can kill the salmonellosis and bacterial infections and also makes the pellets easily to digest. 3. Key parts are processed through vacuum quench treatment with high processing precision, thus have a long service life. 4. Screw sleeve adopts jacketed construction, which can be injected in with hot steam or cooling water, thus the extruding temperature can be controlled effectively. 5. Single-screw extrusion cooking: capable of high production capacities; variable screw speeds. 6. 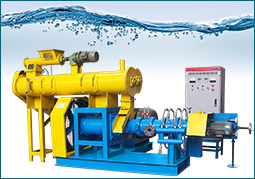 Key parts are processed through vacuum quench treatment with high processing precision, thus have a long service life. 7. You can change different molds to make pellets with different diameters. 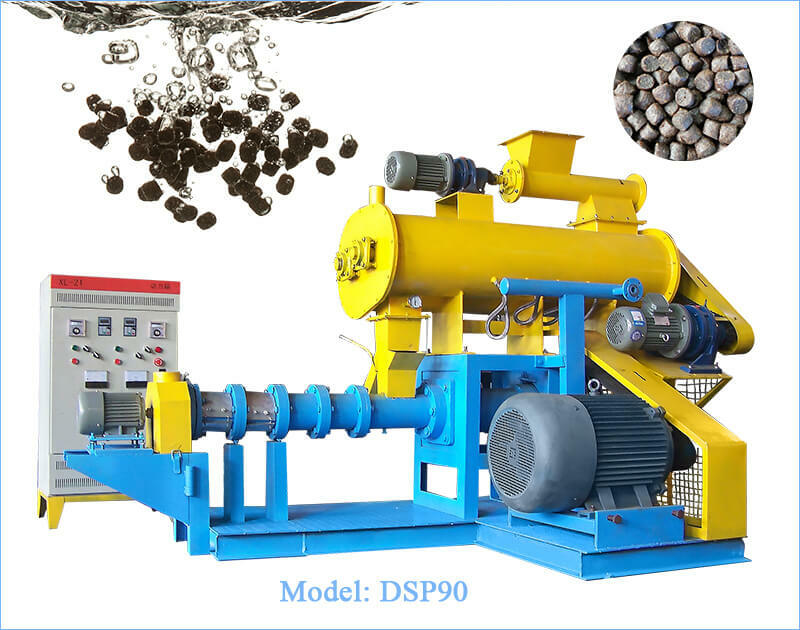 Due to high pressures, shear and abrasion inside the barrel of extruders, the easily-worn parts like barrel, screw periodically should be replaced. 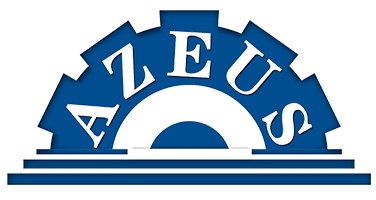 Our extruders are of the modular design so worn components can be easily removed and replaced as needed. Moreover, one fish feed pellet machine is equipped with extra easy wear parts for free including two sleeves, one screw, one cutting knife and three die moulds. The heart of the extruder machine working is: preconditioning, cooking and die shaping. 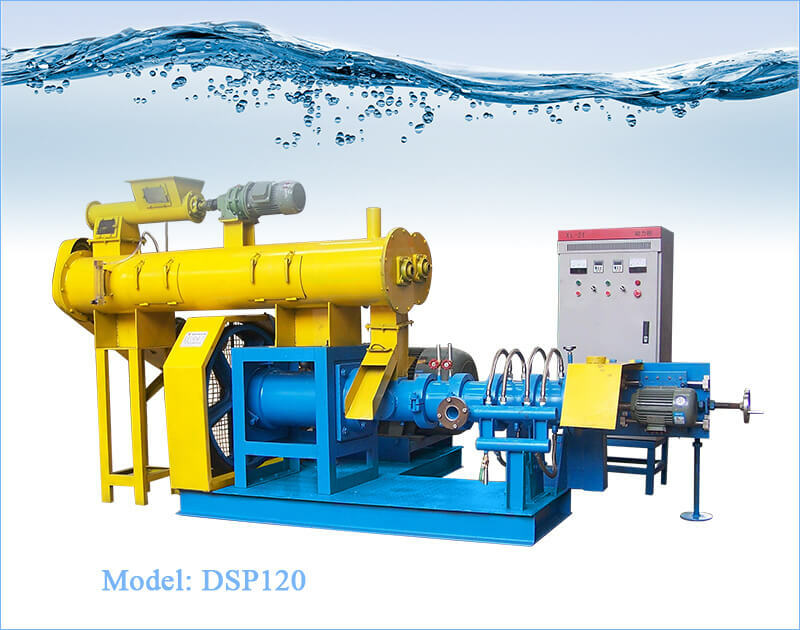 With boiler continuously providing hot steam into the conditioner, mixed materials from fish feed mixer can be fully cooked and the nutritional value is improved. The cooking process can cause a high level of gelatinization of starches, results in feeds with good water stability. The fish feed extruder is a long barrel with a screw auger inside which is specially designed to subject feed mixtures to high heat and steam pressure. When feed exits the die at the end of the barrel, trapped steam blows off rapidly, the soft warm pellets expand, and a low density floating pellet is produced. After that a cutting device will cut the formed pellets into different length as required. The extruder is very versatile, and can make feeds with many different characteristics. 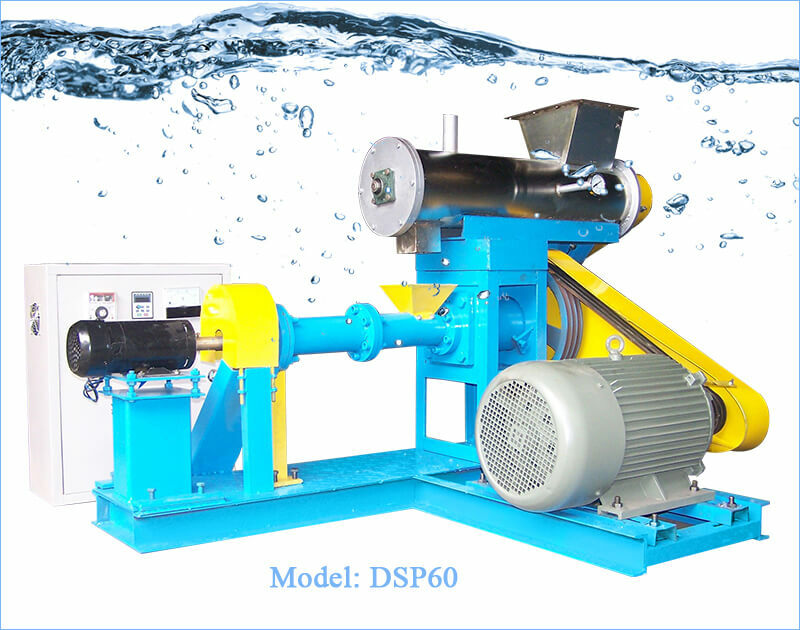 Attentions: our fish feed extruder is of single screw design. The pellets extruded from pellet mill is about 80℃ and moisture content is 18%-20%, so you should equip a dryer and cooler if the capacity is more than 500kg/h. While for small capacity, you can dry them in the sun. 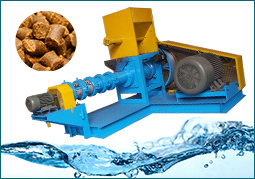 We also provide technical formula for making floating fish feed pellets after placing order.